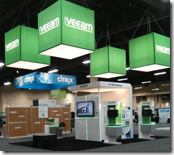 In this installment of the Content Roundup for April 2013, we have no shortage of things going on with the Veeam Teeam! This is a good time as we are really ramping up to v7 of Veeam Backup & Replication, but there are still a lot of other things going on. We’ve had a number of events, a release of the MP, awesome news and some great product and thought leadership content to share. Just recently we celebrated the 5th birthday of Veeam Backup & Replication on May 2, hence why this post is a bit after the end of the month. Nobody likes someone taking attention away from their birthday anyways, right? The countdown to Veeam Backup & Replication continues, and the excitement continues to build. In April we had three announcements as part of our countdown to v7. We’ve listened; tape support is coming with Veeam Backup & Replication v7. See Mike Resseler’s blog post on the tape support announcement, including some screenshots of the upcoming feature. We also announced Enhanced 1-Click Restore (whole VM, files and delegation) and Virtual Labs with Hyper-V are going to be available with v7. The Hands-On Guide on Understanding Hyper-V in Windows Server 2012 is now online. This is a great resource providing practical tips on Hyper-V deployments and Windows Server. Veeam achieved VMware Ready status for B&R! This is a great show of commitment to the technologies VMware and Veeam are providing for virtualized infrastructures. Rick Vanover wrote a whitepaper at Veeam.com about data protection challenges when using VMware vCloud Director. Update 3 has been released for Veeam Backup & Replication 6.5, you can download the patch at KB 1751. Veeam also was awarded two US patents for Instant VM Recovery and SureBackup! These breakthrough features were introduced with Veeam Backup & Replication v5. Version 6 of the Veeam MP for VMware version 6 was released. The Veeam Management pack brings app to metal visibility to System Center environments. See the press release here, a video by Chris Henley and lastly a webinar by Mike Resseler on the new release. Veeam had a great showing at Microsoft Management Summit in Las Vegas. We showed the new MP and backup for Hyper-V; see the picture album from the event on Facebook. That is it for now and of course you can keep engaging with us here on the blog, on Twitter and of course in the Veeam Forums.